The swine flu saga has been of interest mainly because the responses to it have shown what Australians consider to be important. That is also true of the response within Australian churches. Some Catholic churches have discouraged parishioners from receiving communion from the cup, and from shaking hands at the ceremonial greeting during the Eucharist. The response to such measures has been mixed. Some accept the restrictions easily, others resentfully. These responses may correlate with different, though complementary, approaches to the Eucharist. And since in the Catholic Church the Eucharist is the central symbol of the joining of God to humanity in Jesus Christ — the core of Christian faith — the divergent responses may also indicate two different emphases in understanding this core belief. In the first account, the teaching that the coming of the Son of God into our world shows that the world and all we encounter in it are precious. God's becoming human means nothing if our world is bereft of God's presence. All reflects God's glory. The second account emphasises the unique transformation of whatever God touches directly. It sees Christ's humanity as uniquely graced. It sees human beings who turn to Christ as endowed with a unique relationship to God, and sets the miracles worked by Christ and by Christian saints on a quite different level from the daily miracles of life. Those who come to the Eucharist with this second view, focus sharply on the mystery of Christ's presence through the elements of bread and wine. They also emphasise the solemnity of the action by which Christ becomes present. This emphasis on mystery is expressed most clearly in Eastern liturgies where the central part of the Eucharist takes place behind closed doors. In the celebration of the Eucharist, the emphasis on mystery and transcendence is conveyed by the use of distinctive vestments and incense, by fine music, and by formality of gesture and word. The celebration calls for a deep reverence displayed in formality, silence and inwardness. This approach also stresses the boundaries between the sacred and the profane. It stresses, for example, the different reality of the bread and wine before and after they are consecrated, and may restrict to the clergy the right to touch the cup and plate used in the sacrament. Those who see the Eucharist in this way are unlikely to object to restrictions placed on the reception of the cup and on shaking hands during the Eucharist. For them, respect for the mystery of God's presence in Christ in the Eucharist can be shown by not receiving as well as by receiving. And shaking hands is incidental within the celebration of the Eucharist. Those who see in God's becoming human as an affirmation of God's presence within our daily world will also set the Eucharist within a broad context. They will attend to the connections between people in the congregation, the local and universal issues of the day, prayers for particular intentions and small gestures. Because they see the presence of God in the tangible world in Christ as central, they will also make touch and connection central in the celebration of the Eucharist. They will also express reverence in a more complex way that respects the presence of Christ in the Eucharist, but also respects Christ's presence in the members of the congregation and the world in which they belong. They will see reverence expressed appropriately in greetings and attention to other people, in laughter at what is humorous, in intense silence at moments of deep prayer. Reverence is about attention and not about withdrawal. 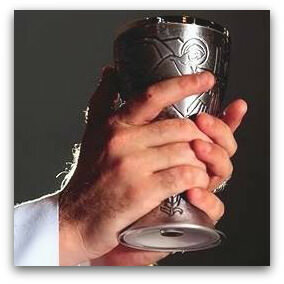 From this perspective, the restriction on the chalice and on shaking hands are significant measures. They restrict the tangibility that is integral to the Eucharist and they limit connection. So those who see the Eucharist in this way will accept such limitation only grudgingly, and will ask for strong evidence that the discouraged practices present a serious threat to public health. Of course these two approaches to the doctrine of God's presence in the world are not mutually exclusive. Most Christians will incorporate each into their faith in different contexts. Neither should be exclusively canonised in the liturgy. While the topic of swine flue is the motivation for this writing the resulting description of two paradigms of Eucharistis is quite brilliant and very apposite at this time. I am a member of the congregation of St Mary's South Brisbane. The second paradigm is the one which would sit so well with our people. We are really happy for others to have the first set of beliefs and practices but would be happier if the church hierarchy had allowed us to pursue our beliefs which fit so well into Andrew's second paradigm. Thank you Andrew. Thank you Andrew. I enjoyed the way you have summed up the "two ways" of experiencing eucharist. They are most helpful I think. For me I am disturbed by the way that the sign of peace has been largely dispensed with as though now we cannot shake hands so let's get on with the real thing approach. People should be encouraged to find other ways of making the sign of peace. I am also concerned that when swine flu cause is gone that the sign of peace and communion from the cup will not be reinstated. I do not share the cup at any time, for health reasons. To me, it is an appalling practice. Why cannot we all receive the Blood of Christ in the same way as the concelebrants at the funeral of John Paul II, i.e., by intinction? This is how we did it in my parish in Japan. With regards to receiving the Eucharist under both forms words come to mind from Frank Anderson MSC. During a workshop six years ago in Byron Bay, Frank stated that by accepting the bread during Eucharist we acknowledge that we are part of a community; drinking of the wine signifies our willingness to suffer if necessary for that community. The community here is not limited to the people gathered for worship but all people, as God resides in every single person. These words immediately made sense to me and, as such, have remained with me since. That is why I do not agree that only the priests can drink from the cup, but that each person should be free to decide whether to drink from the chalice or not. More from Frank: At the Eucharistic celebration we don't change the bread into Christ, we change ourselves into Christ. We need to get into the 'fleshiness' of Christ - into His way of thinking and living. This is what receiving the Eucharist is about. We are the Body of Christ and therefore we are receiving one another. These words emphasise that the Eucharistic celebration is not a private affair but an acknowledgement that we are in this world together and rely on each other to make this world a better place for all by following the example of Christ. Perhaps the focus can be more on what the symbol points to than the details of the symbol itself. We can all thank God that the Doctrine of the "Real Presence" in the Eucharist no longer divides main stream Christians. Normal hygene practises observed in everyday life should be enough to allay any fears of infection. In Anglican circles some communicants intinct the wafer by tipping it in the chalice. It is absurd to stop shaking hands in the Peace for fear of infection. I believe that God would not let me become infected with any sickness through drinking from the chalice. If I felt afraid of infection I would feel that I had lost faith in God's protection. I feel cheated that we are no longer offered the precious blood at Mass. It even seems like sacrilege that we dismiss the gift given to us at the Last Supper. How can we do such a thing? Are we forgetting who did the asking? Are we following Christ fully if we deny his gift to us? Perhaps we could be offered a choice. The scriptures of both Islam and Christianity are full of paradoxes. Some readers of paradoxes simply emphasise only one part of the paradox. Critics of Islam and of Christianity feast on one-sided interpretation of this sort.